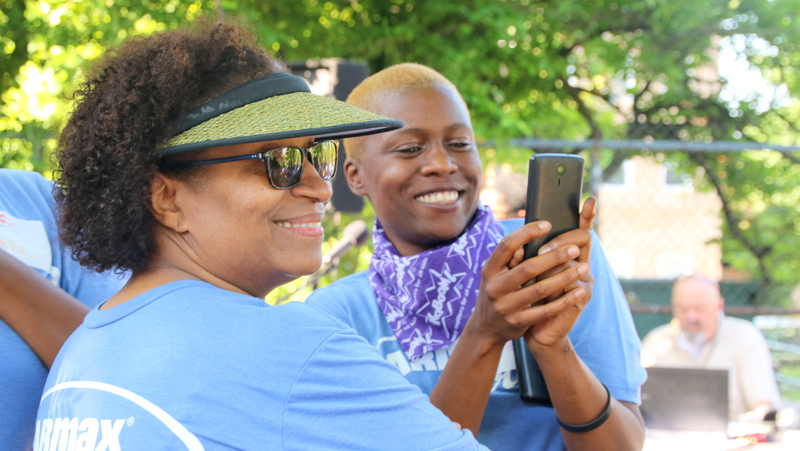 Early yesterday, while everyone else was just waking up or heading off to work, more than 100 volunteers gathered behind Barclay Elementary/Middle School to help with the rebuilding of a dilapidated playground. 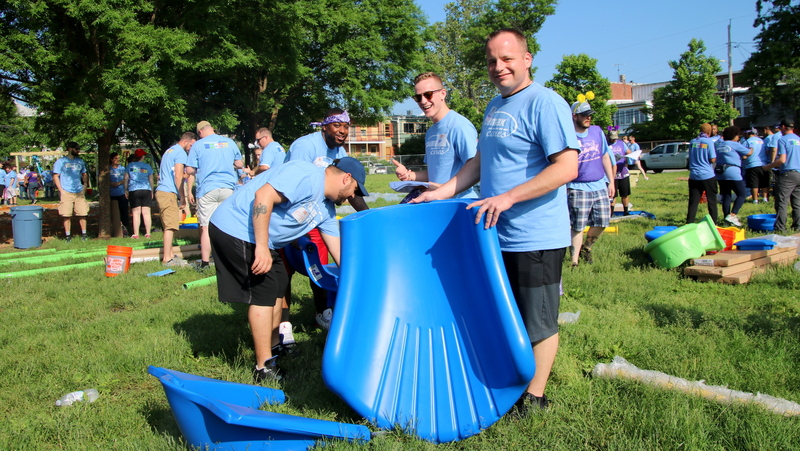 There were CarMax employees, part of the company’s national partnership with playground builder KaBOOM!, a nonprofit focused on giving kids safe places to play. There were volunteers from Johns Hopkins University who had helped demolish the old broken play structure. Still others came from neighborhood uplifter, Strong City Baltimore, that had helped coordinate the event. And, finally, there were Barclay parents, like Kendra Myles, who said they were happy for the army of blue-tee-shirt-wearing helpers. “It makes me feel good to see other people caring to bring resources to our community,” said Myles, whose two children attend the school. “It’s at the crossroads of neighborhoods that don’t really have anything like this,” said one participant. 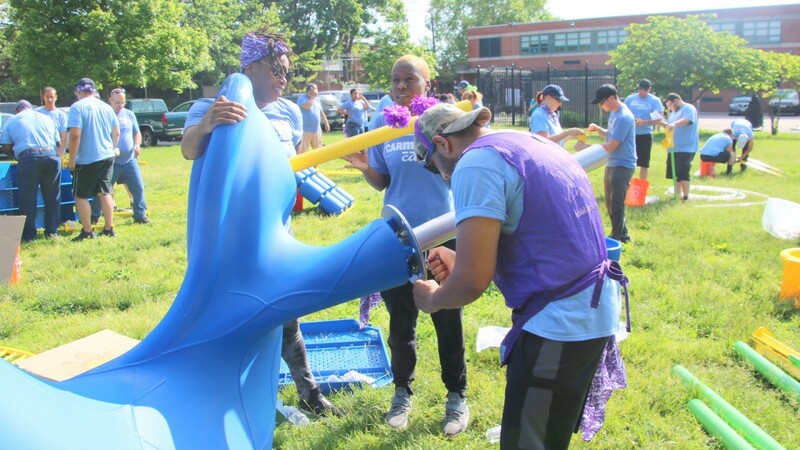 Students did their part by drawing pictures of a dream playground, part of an effort by a multi-neighborhood coalition, Barclay Playground Rebuild Group, to make sure the project reflects the community’s needs. Myles said the process empowered the children to feel as though they – and their parents – can make positively shape other things in their community. As KaBOOM! team leaders directed the volunteers on unloading plastic parts, mixing cement and lining up swings to be hung and slides to be set up, Andy Scott talked about the six months it took to make the urgently needed play space. “It’s at the crossroads of neighborhoods that don’t really have anything like this,” said Scott, a leader of the rebuild group who lives nearby. Children from Abell, Charles Village, Harwood, Waverly and Better Waverly will all enjoy the new facility, he said. As well as savings the trees surrounding the playground, a shade structure will be included in the project. In addition to serving the kids, the new playground will become a resource for the 29th Street Community Center next door, the onetime Barclay Recreation Center closed by the city in 2011. 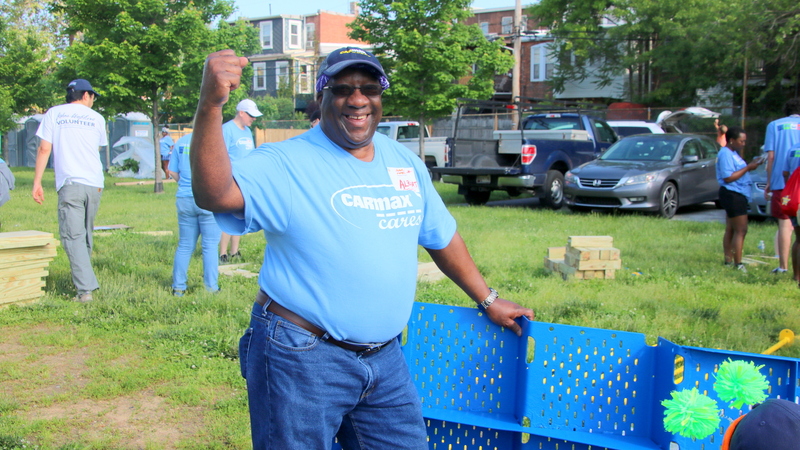 Carmax has partnered with KaBOOM! on seven of these playground rebuilds in Baltimore, according to business office manager Steve Susskind, who noted that, for him, it’s a hometown labor of love. “I grew up in Northwest Baltimore,” he said. Scott said CarMax covered most of the approximately $100,000 cost of the rebuild, but the community was asked to raise $10,000 towards the project. They were glad to do it, he said. “We are very grateful for the people who put their time in,” he said. Volunteers said they were happy to spend a spring morning in the sunshine participating. “This is my fifth KaBOOM,” said Albert Anderson, who volunteered that he is from Jamaica and works at the Laurel CarMax store. “I always like to give back,” he added.